The first of the coupon tips is to buy in bulk. When an item that your family normally buys goes on sale, buy a lot of it! If you don’t already shop this way, you’ll have some changes in the way you think about shopping. But it’s so fun, that you’ll never want to go back to paying full price. It'll take about 3-4 months to build up your home grocery store so that you’re only using on-sale food and consumables. Why? Manufacturers place their items on sale about every 3-4 months. So when an item goes on sale, you need to buy enough to get you through to the next cycle. After you build up your stash, shop from your own pantry. Now you’re only eating products that were super cheap. The second of the coupon tips is to maximize your coupons. Now this is the exciting part. When you use a coupon with an in store sale, you can really save big money. Only use your coupons when an item goes on sale! Coupons are usually valid for 1-3 months after they’ve been issued. In-store sales don’t typically coincide with coupons that are coming out in this week’s newspaper. So how do you maximize your coupons? Learn how to use a free online coupon tool. Let GrocerySmarts.com (Passport Code g84sjw) do all the research for you. They check out the sales in Utah and Nevada grocery stores, look for coupons that will make the sale a better deal, and pass this information on to you. You can use this online tool for free. This is what made using coupons come alive for me. No more clipping coupons, just file your coupons away and wait for GrocerySmarts to tell you which coupon you need to make a good deal great. I’ll explain the simple coupon filing system on another page. Let me show you how this works. Teen Spirit Deodorant (by Lady Speed Stick 1.4 oz) is normally $1.78. It went on sale for $0.88. GrocerySmarts listed the sale and listed the newspaper insert that had a coupon for $0.50 Lady Speed Stick/Teen Spirit Deodorant. I clipped a coupon from each of my four inserts and bought my four teenagers deodorant for $0.38 a piece. To see more examples check out my weekly shopping trips. 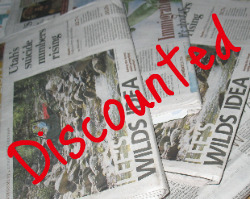 The last coupon tip is to buy multiple Sunday newspapers. The more papers you have the more coupons you get. The more coupons you get, the more money you save! The savings are exponential! How many newspapers should each household order? 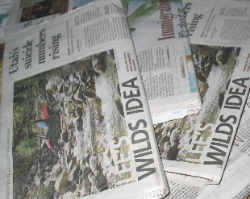 Getting 4 newspapers per week is sufficient for most households. If you have a large family you might want to order more. Why should you order 4 newspapers? You can buy enough product to last until the next sale. Instead of just being able to buy 1 item at a good price, you can get four. Is the newspaper the only place where you can get coupons? No, but it is the most reliable place to get them. You can print some coupons online and get them from other sources, but this can be kind of chancy. You can always count on your newspaper coupons being there when you need them. 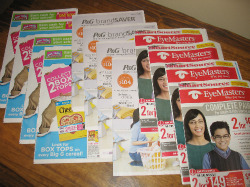 Most of your great coupon deals will come from SmartSource, P&G Brand Saver, General Mill, etc. These coupon inserts come in your Sunday newspaper. It feels like the newspaper is sending you cash. The newspaper pays for itself in 1-2 shopping trips. Right now we have a super deal on newspapers. Click here to find out how to get your discounted newspapers through Provident Living Today. Need Coupons! They come from the Sunday paper and we can get you a great rate on a home delivery subscription!